« I Support John Boehner’s Plan. Here’s Why. John McCain took it upon himself to do everything he could to help Democrts ridicule and marginalize the Tea Party and Tea Party candidates yesterday. I supported John McCain’s presidential bid because as bad as we was, he was still better than the now-documented failure of Barack Obama. But I held my nose to support him – at least until he nominated Sarah Palin. John McCain ran a dismal and pathetic campaign. On my view, he was far more concerned with maintaining his “Senatorial dignity” than he was with saving America from a dangerous Marxist fraud. As just one example, consider his elitest refusal to go after Barack Obama for his twenty-plus years spent in a racist, Marxist and anti-American “church” under the “spiritual mentoring” of a wicked Jeremiah Wright. Even Obama said that attack would be legitimate, but John McCain was far too hoity toity to pursue it. Democrats always tell us that RINOS are “their greatest threat.” They did it with McCain, and they are doing it now with RINO Jon Huntsman. And RINOS are fool enough to believe Lucy and keep trying to kick the football. Conservatives know the RINO is a RINO and have no enthusiasm for the useless RINO whatsoever, and the RINO doesn’t have enough of a principled stand on anything to garner powerful support from anywhere else. And thus down goes the RINO. I supported John McCain for president and gave money to his campaign. He STILL keeps hectoring me for money. I supported Scott Brown and sent money to his campaign, too. And HE still keeps hectoring me for money. One went down in flames, the other pulled off a win. But neither one of them ended up doing a dang thing that made my donation worthwhile; and I won’t be making those mistakes again. Prior to his run for the presidency, I largely regarded John McCain as an embarassment whose sole quality had been his suffering as a POW during the Vietnam War. And now, since his failed run for the presidency, I AGAIN largely regard John McCain as an embarassment whose sole quality was his suffering as a POW during the Vietnam War. The bottom line on RINOS is that you simply cannot trust them to take a strong and courageous stand when the heat is on. And why this man was so willing to attack Christine O’Donnell when he couldn’t bring himself to attack Barack Obama when it counted is utterly beyond me. 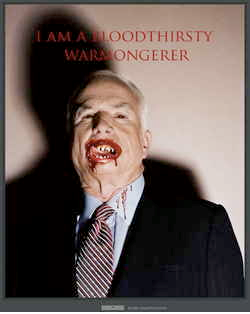 This entry was posted on July 28, 2011 at 2:53 pm and is filed under Conservative Issues, John McCain, Politics. You can follow any responses to this entry through the RSS 2.0 feed. You can skip to the end and leave a response. Pinging is currently not allowed. In case you missed this Michael, I’m sending it to you. I cried as I listened to these words today. Standing as a Conservative who has been participating in the Tea Party since it began, it just gave me courage to keep fighting the eilites in the R party and the evil Obama/Democrat machine. May our Lord Jesus BLESS and STRENGTHEN those courageous men and women in DC who are truly keeping their pledge, putting America first and fighting valiantly. And the rest of us who are doing our part where we live. I agree and disagree with Rush. I want the same things he wants, but I also recognize that we control the HOUSE. We do NOT control the Senate and we do NOT control the White House. We do not have the power to dictate our agenda. We ONLY have the power to shut down government. And if the government gets shut down, it will be a bad thing. And Republicans will get the blame if they overstep the power that they have (one-half of one of the three branches). I believe that we need to hold out for the best deal we can get, and then make sure that the difference between the Republican agenda (cut spending and return to fiscal sanity) and the Democrat agenda (spend reckelssly until America is a banana republic) are clear. And then take the White Houe and the Senate in 2012. And THEN we can get the reforms that this country needs. I believe that John Boehner is a good man who is trying to do the best he can with what he’s got. And I think if Rush Limbaugh or even Michelle Bachmann were in his position and HAD to get something done to avert disaster, they would be acting similarly. It is my view that if we shut down the government, the economy will TRULY tank and Obama will be able to run on the fact that Republicans shut down the government and therefore Republians are to blame for the terrible economy. I truly believe at this point that Obama is HOPING Republicans shut down the government. He has NOTHING to run on; his ONLY hope is to demonize Republicans. There’s one more thing I’d say: I believe that we need to rally around our leadership and trust them in this fight. John Boehner is ALL we’ve got. If he had lost this vote today his Speakership would have been finished. Meanwhile, the Republican Party would (and still could) break up into a bunch of separate fiefdoms. In any battle, the side that fights within its own ranks LOSES. So it’s one thing to bless “the courageous men and women in DC who are truly keeping their pledge.” But at some point “politics” is about making the best deals one can make while working toward a stronger position and a better tomorrow, rather than playing suicidal games of chicken. And some of the promises that some of the Republicans have made are tantamount to “We will hit a grand slam home run,” which is to say that they shouldn’t have made the promises they made. If there are Republicans who are saying, “We will get EVERYTHING or we will shut down the government, and we will continue to hold out for everything even if America defaults and collapses,” that becomes truly frightening. At some point they have to make a deal. It’s in the country’s interest, and it’s in the Republican Party’s interest. I know you’re a good woman with a great heart, HL. And I’m sure you know I want the same strong fundamentals you want for America. My prayer is that the Democrats have more fear, and the Republicans have more wisdom to know what to do and when to do it. I’m not asking Republicans to “compromise” with Democrats. Democrats have proven both in this situation (demonizing the Republicans’ bills when they’ve had NO bills and NO leadership of their own as just one example) and many others in the past that they are utterly dishonest and depraved. What I am asking Republicans to do is cooperate with their own Republican leadership; when the top Republicans in leadership – put there by their fellow Republicans I might add – say the GOP has to work together, then surround the wagons and work together. Or the “Indians” will massacre us. Btw, I KNOW Obama has lied and fearmongered and exaggerated the “default” on August 2. What is both sad and terrifying is that Obama’s demagogic rhetoric will very likely lead to a reduction in the US AAA credit rating even though we will pay our primary obligations. I am concerned that that reduction will hurt us badly as our interest rate begins to go up and up and up. If the bondholders were frightened by Obama’s refusal to rule out default and fearmongering that we MIGHT default, it will get truly bad very quickly. I believe we should get the best deal we can get and position ourselves for 2012. I do NOT think we should play chicked with people who literally don’t give a damn about America and who literally HOPE it collapses. I don’t disagree that we have to be thoughtful being that we control 1/3 of the lawmaking government (technically it’s 1/2 of 1/3 of the total government as listed int he Constitution but the Supreme Court is…well a check and not a legislative arm….ok so maybe it is legislating but that’s not its role…we’ll get back to this another time) but we also can’t be weak in the knees and let the Dems walk us down whatever road they want. I wanted Cut, Cap and Balance but I was willing to accept a little less to get their support. Tax increases I’m against completely, no balanced budget amendment vote I’m against and cutting just $2.1 Trillion in future spending INCREASES. They aren’t cuts from our current spending, they aren’t cuts at all really, they are reductions in future increases (growing some departments by 115% instead of 120%)…I need SUBSTANCE and if the Obamacrats won’t commit to SUBSTANCE…let the debt ceiling be reached…if we default on Defense, SS, Medicare/Medicaid or the interest on the debt it’s on Obama because we have plenty of money to cover those expenses. Now, if a few starving artists actually end up starving because their government handouts for their crappy paintings end…I’m actually fine with that. I’m pretty much with you. I supported John McCain in 2008 (after the man had enraged me so many times I’d vowed to myself not to support him again) because 1) I saw the genuine danger of Obama like a vision from heaven; and 2) because of Sarah Palin. But the man’s pathetic campaign let me down; and then he returned to his RINO ways. At least you know what you’re getting with Christine O’Donnell (she’s NOT a witch). Here’s my view, which I’ve set forth in other articles and comments: should we “compromise” with Democrats? Absolutely not. Democrats are vile and cannot be trusted. But we SHOULD compromise with the Republican leadership. If they believe they’ve got the best deal they’re going to get in a divided government with Democrats in power, then conservatives need to back their guys. You know the famous quotes: “A house divided against itself cannot stand” (Jesus, Lincoln); “We must all hang together or surely we shall all hang separately (Franklin). If we divide ourselves, we lose. My view is akin to Alan West’s, who put it in terms of his military career, only I would put it explicitly in terms of “Rally behind your leader.” If you’re a junior officer on the battlefield, and you decide you’re going to ignore your general and go your own way, you open up your own side to a slaughter as they enemy pours in to the gap you left because you had a better plan. I think Republican tea party caucus people played it about as well as they could have. I think the final figure is that 43% of them opposed the final deal – which made them “less terrorist” than the 49% of Democrats who opposed the deal. We need to win in 2012. If we pushed too hard now, it would have been too easy for Democrats to depict us as “extremists” which they routinely do everyday anyway – and undermine us for 2012. If we have the presidency and the Senate, we can start cutting down government.